Hello and Welcome to #WednesdayBookClub. 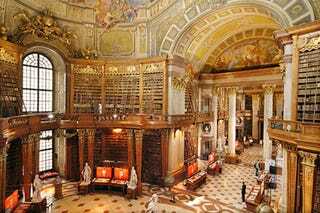 I'm your host, GeeseJuggler and today's picture is from the Nation Library of Vienna, Austria. Let's get to talking books! I'm currently reading Old Man's War by John Scalzi and I'm almost finished with Part 2. I'm loving the balance and dark, funny and military. I was afraid that it would be too much of one without the others but I like it! Rumor in the House of Juggler is that we're doing yet another library trip but unconfirmed. What about you all? What have we read this week?